Hello Fashion Rulers. F&R Guy back again, coming off a very exciting final major of the season. Wait, CBS says its Glory’s Last Shot. That’s kind of sad, no more glory. Anywho…this years PGA was extremely special for me because I GOT TO GO!!! Yes that’s right, you may have seen me walking the fairways with Tiger, Phil, Sergio, Brandt Jobe, or any number of A list golfers. We are going to veer a little bit from the fashion side for this blog, though we may end up back there at some point, we usually do. Instead I’m just going to give you my thoughts, reaction opinions, and general randomness on the 93rd PGA Championship from The Atlanta Athletic Club in Johns Creek, GA. And if you don’t like it, leave this blog. No stay, we need the ratings. Hold on a sec, if it’s in John’s Creek, shouldn’t it be the John’s Creek Athletic…it’s not important. Lets go. First thought, the city of Atlanta and the AAC get A++ marks for running a 1st class tournament all around. Parking was free, shuttle buses ran non-stop right to the front gate, and lines were minimal if at all. First complaint, it was HOT. I mean really hot. That’s just how it is in Atlanta in August. Plenty of water available, and frozen lemonade. Despite the heat and lack of rain, the course was immaculate. Unbelievable shape. Greens looked and rolled great, fairways and rough were lush and green, tee boxes were cut perfectly. Superintendent did a wonderful job. 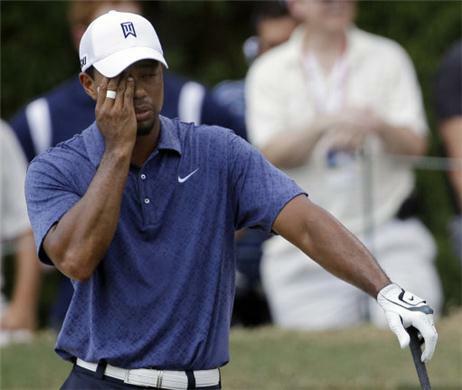 Next thought, golf needs Tiger Woods, and he didn’t look good. Ill confess, a huge Tiger fan writes this blog. I spent the entire day Friday sweating and following Eldrick. From the putting green, where Luke Donald waived and winked at my mom, twice, all the way to the 18th green, I was within shouting distance of the greatest golfer of my generation. I could have reached out and tapped Bryon Bell, Woods caddie, on more than one occasion. On a side note, I saw Chris Rock eating at a mid-town Atlanta restaurant on Sunday night. That was cool, that guy’s hilarious. Woods performance has been well analyzed, so I wont go shot by shot. There was some good and some bad, flashes of brilliance followed by holes of mediocrity. But the true impact came Sunday afternoon, while Tiger was most likely at his new home in Jupiter, FL. The final day of the final major, and besides Phil Mickelson’s crowd, the place looked like a Wednesday Pro-Am at the Greensboro Tour stop. Tiger Woods does not just move the needle in professional golf, he is the needle. The buzz on Friday was palpable, everyone wants to talk Tiger. Sunday afternoon…crickets. Please return to form Mr. Woods. Final thought, maybe. The finish was spectacular. Say what you will about the lack of names or star power on the leaderboard, I think I just did, but Keegan Bradley and Jason Dufner put on a great show. And those final 4 holes are brutal. I stood on the far back 15th tee, for a second, and it is very, very long. Bradley won with gutsy comeback birdies on 16 and 17 and Dufner bogeyed 15-17. Fashion Guy would say, pink shirts don’t win major championships. Discuss. It was a great finish to a well run event, I just hope people were watching. I was, from my hotel room, I had dinner reservations to get to. All in all, an amazing experience that I wouldn’t trade for anything. I highly recommend if you have a sister who lives in a city that’s hosting a major, and she or your mom buys you tickets, go. You won’t regret it. And bring sunscreen. On a small fashion note, I recently got to preview the new Nike shoes and Puma apparel and shoe line. Wow, incredible stuff all around. I may need more hangers and shoe holding things come the end of the year. Well that’s all for this post, hope you enjoyed it. Comment away. Until next time golf fashionuts, remember, rules are rules. How did Tiger’s prototype Nike Free golf shoes look? I saw pictures, but nothing great.